Just like people, dogs too suffer from a sensitive stomach. Dog owners often say that dogs are exactly like humans. Well, maybe not 100%, but they are close. 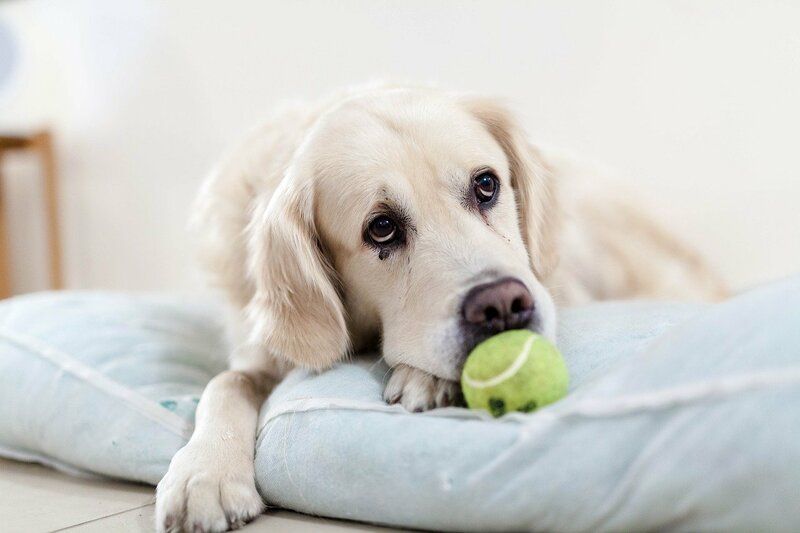 Dogs suffer from all the diseases we do, including diabetes, heart problems, stomach problems, blindness, and so on. Sensitive stomach is rarely a life or death issue, but you do not want your puppy to struggle to digest their food. With that in mind, what is the best food for a sensitive stomach? For humans, the best food is following the BRAT diet. You know, the diet your doctor prescribes when you suffer from diarrhea or other stomach problems. BRAT stands for banana, rice, applesauce, and toast. Well, for dogs, the best food for sensitive stomach is similar. Before you look to change the food of your pooch, have a veterinarian examine your dog. You need to ensure the dog is having problems. Yes, there might be symptoms, but you want to be sure, as some other health problems have symptoms similar to a sensitive stomach. What are the symptoms of the sensitive stomach? Dogs exhibit a similar set of symptoms. And when you look at these symptoms, you will be even more convinced that they are much like us. However, some dogs experience more symptoms, others less. Of course, they are all individuals. Here is a quick breakdown of the symptoms of a sensitive stomach in dogs. Why does my dog suffer from a sensitive stomach? There are a lot of things that can cause a sensitive stomach in dogs. You need to examine all of the factors to understand what is the most troublesome cause. While there are common things causing upset stomach, you also have to do an elimination work and engage in a little trial-and-error sort of thing. Here are four of the most common causes of an upset stomach. Switching to a new food is not easy in dogs. You need to transition your pooch from one dog to another in a slow and gradual manner. For dogs that do not digest well, it is that much more important. According to veterinarians, you should start really slow, with a bowl containing 80% of their old food, and 20% of the new food. Increase the percentage of new food to 30-40% on the next day, and continue doing so until you reach 100%. Usually, it takes between 5 and 7 days. Do not expect positive results immediately. Some dogs will still need time to adjust to the new food and the reduced allergens in it. What to look for in dog food for sensitive stomach? When we talk about what makes the best dog food for a sensitive stomach, it is the ingredients. We said that some dogs do not process fat and proteins well. But the food has to contain fat and proteins. The trick is that they come from a source that is easier to digest. Here are a few things that make food good for an upset stomach. 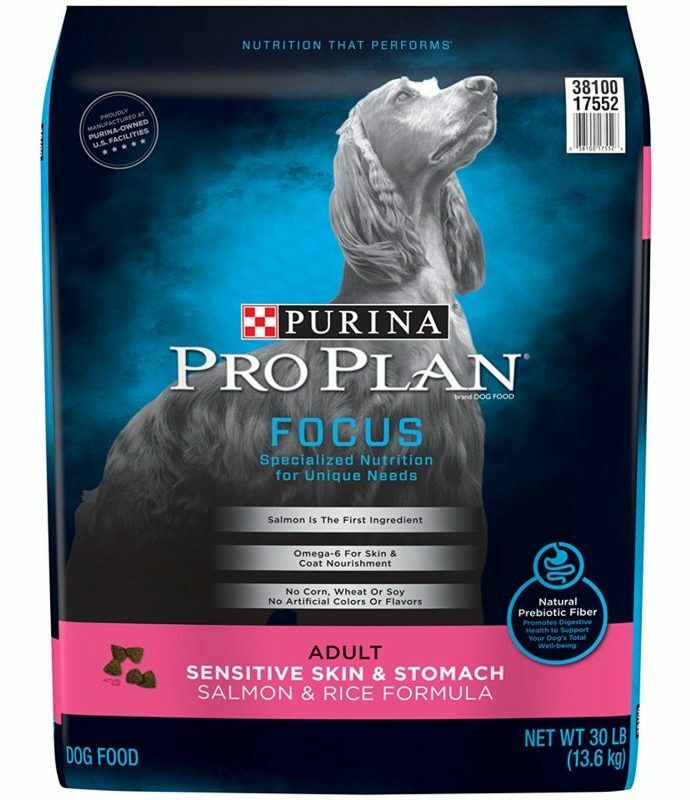 Purina Pro Plan is one of the cheapest foods for sensitive stomach you can find on the market. It is a nutritionally balanced, and easily digested. Made with real salmon, rice, and other ingredients. There are no artificial dyes or flavors added so that you avoid stressing of the dog’s stomach. The formula also contains antioxidants and prebiotic fiber that support the well-being of your puppy. 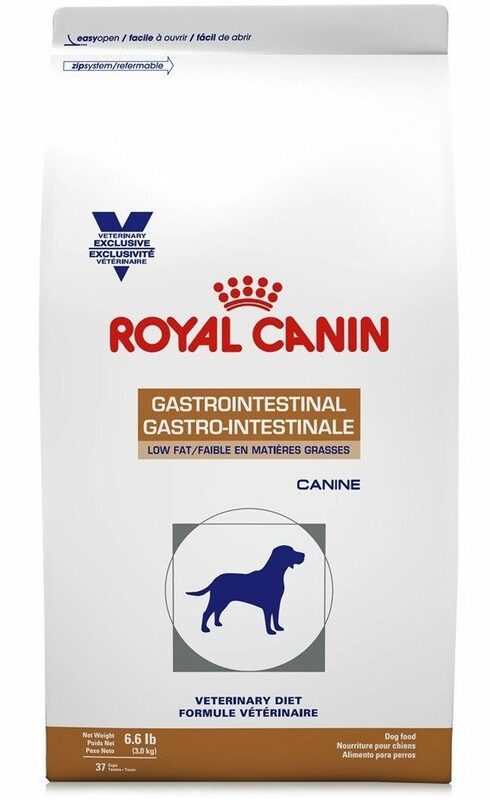 This might not be the least expensive product on the market, but if you have a dog with special health issues, the Royal Canin is worth every penny. The food has the lowest fat on the market, between 4.5% and 8.5% crude fat. That helps prevent reoccurrence of pancreatitis and other digestive issues. Contains easily-digestible protein and complex carbs. Thanks to the low fiber content, the food presents no stress to your dog’s digestive system. In addition to targeting troubling health issues, the food can help you keep your puppy from packing some extra pounds. It is great for lowering the weight of the dog as well. The food contains no preservatives or additives, and everything is a natural product. 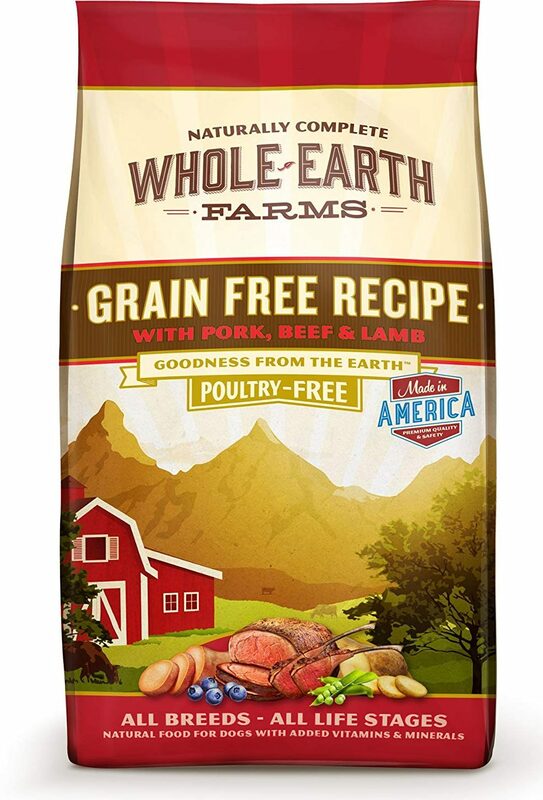 Yes, beef and pork might not seem like something easily digestible, but it works in the formula. Pork is a high-quality protein, and dogs love it. In addition to solving an upset stomach, the formula supports healthier skin, less shedding, and a shinier coat. For dogs with poultry sensitivity, this food is great, as it is a poultry-free recipe. 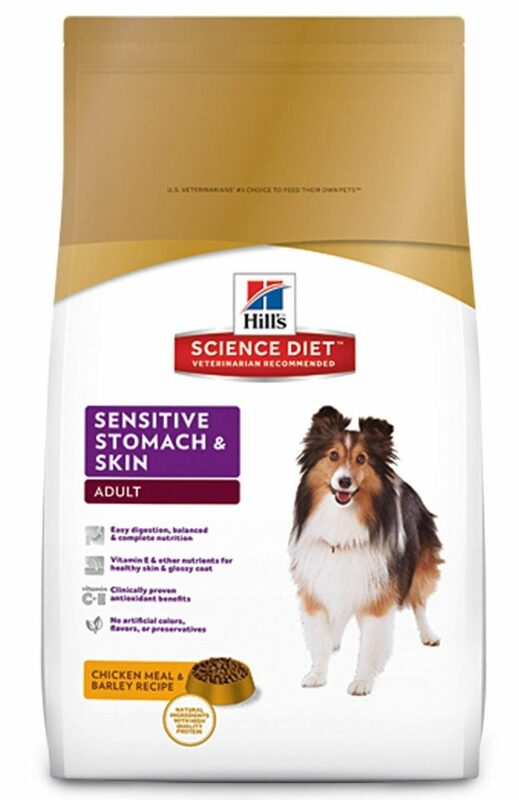 This is one of the best dog foods for a sensitive stomach. The formula is great and provides easy digestion and complete and balanced nutrition. Not many foods can deliver all of that in one formula. Yes, it contains some additives, but they are all high-value and have been tested so that your pet’s stomach can handle them. 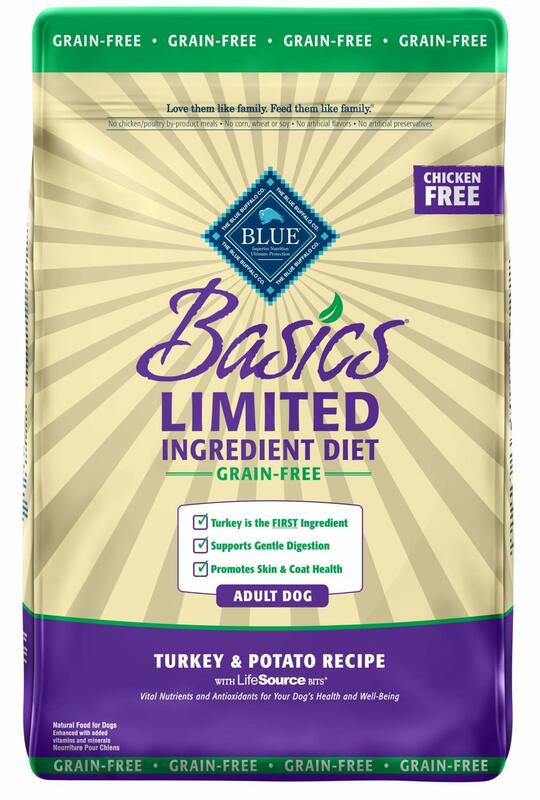 Made in the USA, Blue Buffalo is one of the most highly rated dog foods available on the market. It is also one of the rare foods made with turkey and potato as basic ingredients. That is a welcome change from the chicken and rice combo. In addition, it contains oatmeal, and brown rice, all of which are easily digested by puppies with a sensitive and upset stomach.